Fig. 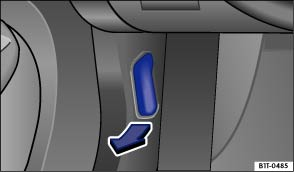 172 The bonnet release lever is located in the driver side footwell. The lever for opening the bonnet can only be operated when the driver door is open. Please ensure that the windscreen wiper arms are lying on the windscreen before opening the bonnet . Pull the release lever in the direction of the arrow . The bonnet is released from its lock by a spring mechanism . Lift the bonnet at the release lever (arrow) and open fully. The bonnet is held in the open position by the gas-filled strut. To close the bonnet, pull it down to overcome the gas strut pressure . Let the bonnet drop into the catches – do not press it down! If the bonnet is not closed, open it again and close it properly. The bonnet will be flush with the body parts around it once it has been closed properly. The indicator lamp in the instrument cluster will no longer be lit up . If the bonnet is not closed properly, it could open suddenly while you are driving and completely obscure your view of the road. This could lead to accidents and serious injuries. After closing the bonnet, always check that it is properly secured. The bonnet must be flush with the surrounding body panels. If you notice that the bonnet is not closed properly while the vehicle is in motion, stop the vehicle as soon as possible and close the bonnet. Therefore the bonnet should only be opened or closed when you are sure that nobody is in its path. 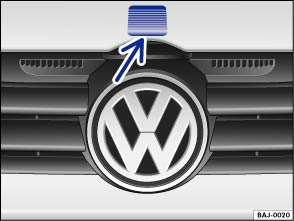 The bonnet should only be opened when the wiper arms are flush to the windscreen in order to avoid damage to the bonnet and the windscreen wiper arms. Always fold the windscreen wiper arms back onto the windscreen before driving away.